Three weeks in Paphos, Cyprus and I already have a new hobby. I daily started practicing to greet unknown people in the street. Why? Well, obviously I do it on purpose. My general impression of the locals is of grumpy, non-stop complaining, hard to please people, able to explode for no reason. 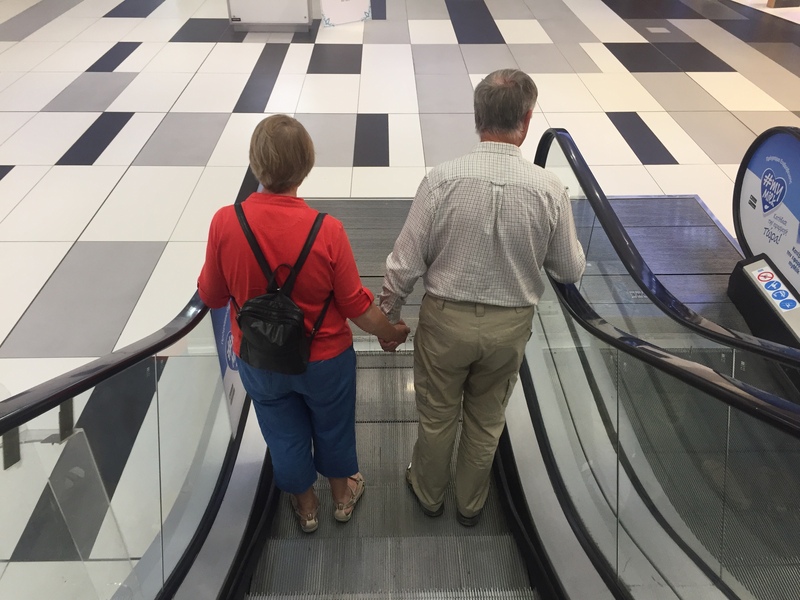 They look somehow distant, in a hurry, overloaded by problems, never smile and never greet, while passing by. I understand – greeting unknown people is out of the local culture, but my aim is to brighten a bit this thunderous attitude. At the Broadwalk (I mentioned it in my previous article “10 reasons to holiday in Paphos”) while you are passing the tourists, they always smile at you and politely greet you. Of course, mostly German and British couples. The Russians never smile and salute. So, I got the idea to spread smiles and greetings as often as I can, even if it looks bizarre. And guess what – it works out. I nod my head, smile widely and greet every person passing by. Surprisingly, they reflect positively and I feel as a proud life changer. Everybody comes to Cyprus for two reasons – the mild climate and the sea. The first one is granted, but the second one is a big issue. There are not good beaches in Paphos! And this I can claim as a long-term witness, living on site. All the city beaches are rocky, ugly, covered by mountains of rotting seaweeds. No one cleans those mountains, so it looks really unpleasant. If you find any sandy beach, I can guarantee it will be very tiny, with limited sandy line and the seaweeds on. As an extra, lying on those sandy lines, the tourist gets plenty of ants and flies, probably attracted by the seaweeds. The sand is rough and mixed with lots of coarse particles. Walking barefoot is quite tricky, even dangerous. Some sharp piece from those sands, could spike or jab your feet, as it happened to me. I got recommended to go to the Lighthouse beach, Faros beach and Kefalos beach village. Also to the beach in front of Alexander The Great hotel. Following the recommendations, I visited all of the mentioned above, just to find the general description matches them too. To be precise, Alexander the Great hotel’s beach was very tiny, but not that dirty, also no flies and ants, so maybe that’s the best one I experienced in the city frame so far. The seawater is really transparent and clean, but it’s full of rocks, stones and seaweeds underneath. To rent a sunbed costs 2.50 Euro. For un umbrella the price is the same – 2.50. But you should bring your own towel on the beach. To place that towel over the sand is free of charge. I heard there is a beach out of the city called Coral Bay. Some of my colleagues claim it’s really nice. I plan to visit it in the upcoming days, but it’s a bit difficult for me, because that beach is unreachable on foot. I need to catch bus N 615 and to get off at the last bus station. The other option is to go by car, but I do not have one here. 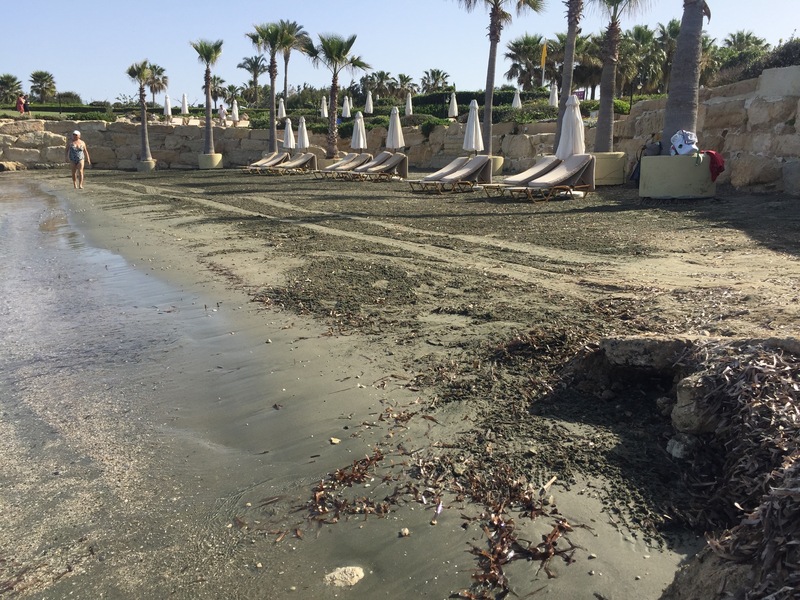 Even the beach of the best 5 star hotel in Paphos, is covered by something, that looks like green-grey silt. I was told it’s not a problem to place my towel there, because the beaches in Cyprus are public and it’s not possible to reserve any piece of land as private or exclusive. But I find it really disgusting to place a towel over the silt. Rip currents can be hazardous to people in the water. Swimmers who are caught in a rip and who do not understand what is going on, and who may not have the necessary water skills, may panic, or exhaust themselves by trying to swim directly against the flow of water. 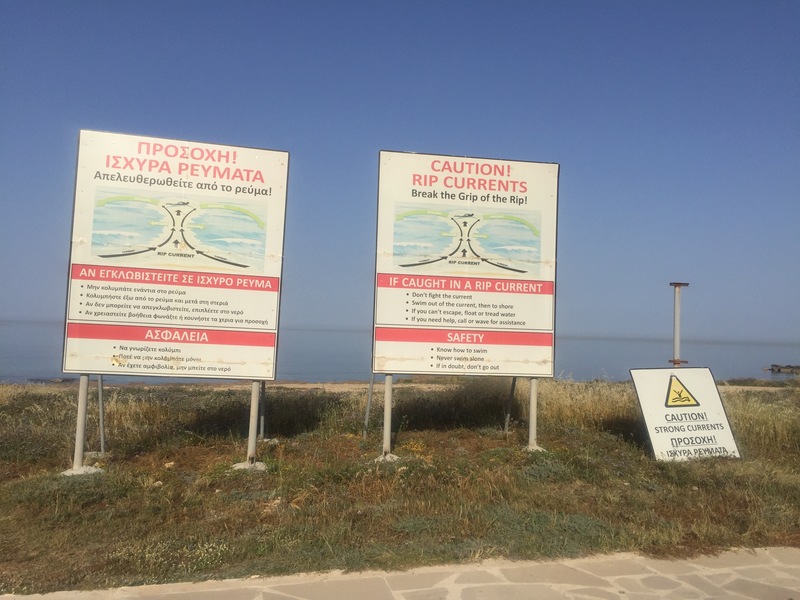 The rip current is a regular threat at Paphos beaches. On every beach having been installed signs, warning about the danger. 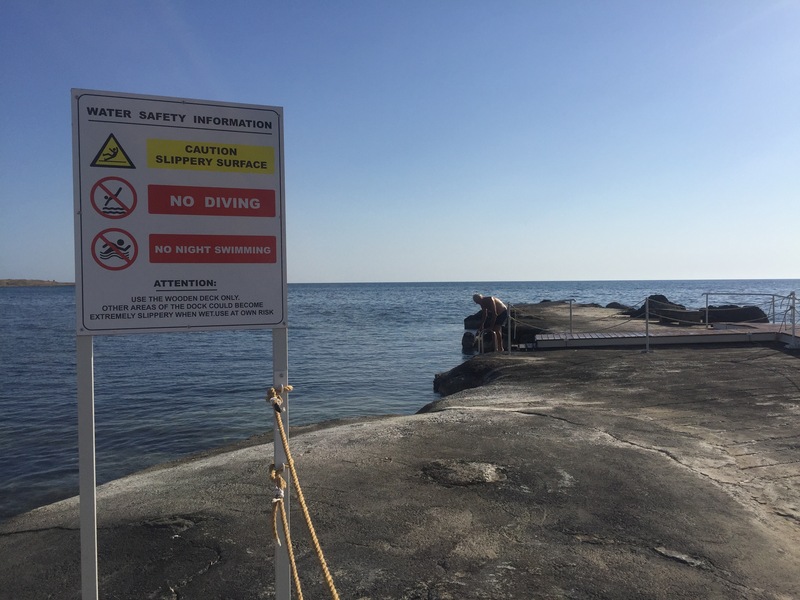 Those signs are bilingual – in Greek and English, to make sure the swimmers will be properly informed in advance about the threat. Regardless the well spread information the sea still takes victims of the rip current every year. 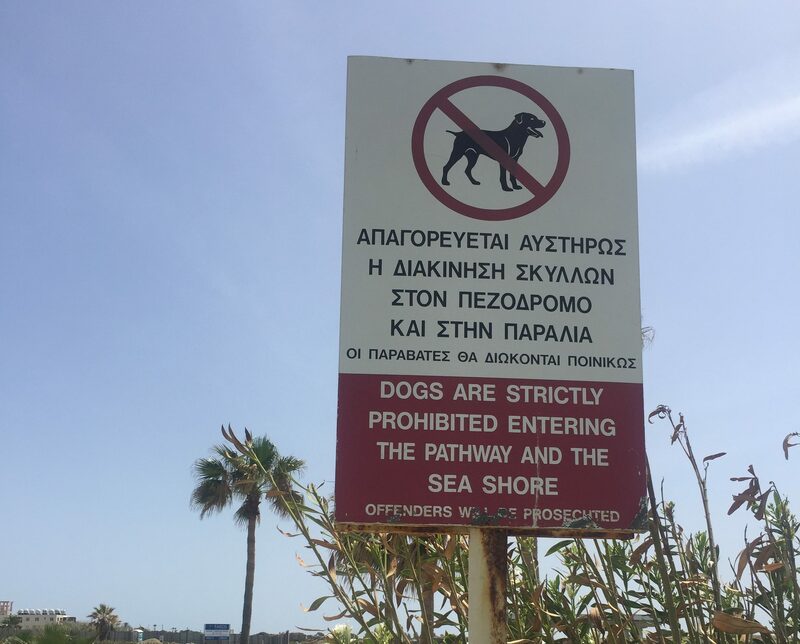 Everyone in Paphos lives with the clear idea the rules exist to be broken. No rules in here. If they were already established, no one pays attention. The people (both locals and tourists) are used to ignore the rules, but I believe the tourists just quickly learned it from the locals how to break it proficiently. For example, a sign No dogs, which means the particular area is not allowed for dogs. Right behind the sign you will meet plenty of dog walkers, along with their pets and all the traces of that walk. 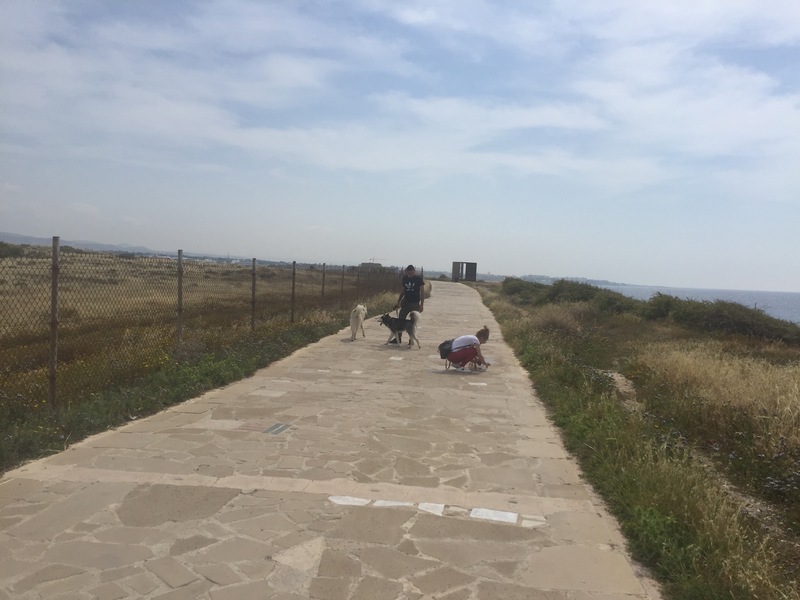 In Paphos the dog owners are not used to clean after the dogs, simply believing nature will take care of it. If there is a sign No diving – then jumping from the hotel’s balcony into the swimming pool is a must. Often it happens just next to the sign, to prove the prohibition is not applicable and should be ignored. Recycle in Paphos is just an optional action. There is a system of blue and green containers, where the trash should be separated by material and origin. In the blue containers (for plastic bottles) could be found a rich collection of any home rubbish, including organic remains, food, toilet paper, glass beer bottles. The plastic bottle bins are not supposed to smell bad. Passing by, though, you would feel the rotting organic garbage stink. It’s really an awful odour. Smoking is a local culture. Three weeks in Paphos and I believe everyone is smoking in here. I have never seen any sign to prohibit the smoking anywhere in Paphos. Ohh no, I was incorrect. I saw (once) a plate on a cafe wall, that warns “The smoking can be dangerous for your health”. I guess it counts. The truth is, the smokers are fully tolerated and favored by the lack of rules. If you are a convinced non-smoker (as I am), it’s something normal next to your table or behind it, to sit an addicted smoker (or a group of them), who would poison your enjoinment. The way to shut the door in Paphos is by slamming it. It seems like a local culture as well. I have never seen other way to close it here. All doors are being slammed. The apartment door could be slammed about 20 times a day average (could be more). The neighbors seem to be already used, because no one complains. They would rather ignore it, even if it happens at 2 am every night. Keeping silence for the others comfort before 8 am, between 2 pm and 4 pm and after 10 pm… what did you say? Ahhhh, OK, you mean good manners? No, no, no, this is not applicable for Paphos. Starting from the beaches, going through the streets, then to the green areas …Paphos is a messy spot. Everywhere empty beer or coca cola cans, cigarette paper boxes, torn chips packages, plastic bottles…whatever you name, would be probably found in the streets or around them. I experienced the level of cleaning in a 5 star hotel, so I could say it’s questionable too. You can’t be sure what kind of cloth was used to polish your glass or cup in the room. Someone else’s hair still could be found upon your arrival in the hotel room, food crumbs over the armchairs; the decorating pillows over the bed are with a questionable hygiene as well. I would also recommend the cleanliness of the pottery and the cutlery (while in a restaurant) to be checked as well. You could be unpleasantly surprised. The plate’s stains are a normal phenomenon. For sure not everywhere, but it happened to me several times. Never ever try to drink it!!! It’s only for showering and washing. I got advised by the locals to never experiment with, even if I die from thirst. I was told, if I don’t want to experience a terrible stomach disorder or sickness, I should stay stuck to the packs of mineral water. There is a comfortable 6 bottle pack, each bottle is 1,5 l. In supermarkets like Lidl and Sklavenitis (in the Mall) this pack could be bought for just 1,5 Euro. If you see the same 6-bottle pack for 2, 75 or even 3,50 Euro, you should consider yourself tricked, because it’s really overpriced. Also there is a special filter, which should be fixed in between the tubes, leading to the tap. Compromisingly, if such a filter was installed, then the tap water could be used for cooking. No filter, no cooking with tap water. Paphos is a holiday spot, so most of the income comes from the tourists. Expectedly, the merchants and the vendors are trying to increase their turnover by doubling and tripling the price of the products. Coming for just a few days or a week stay, the ignorant tourist does not have a basis for comparison and would be caught easily by the merchant’s tricks. 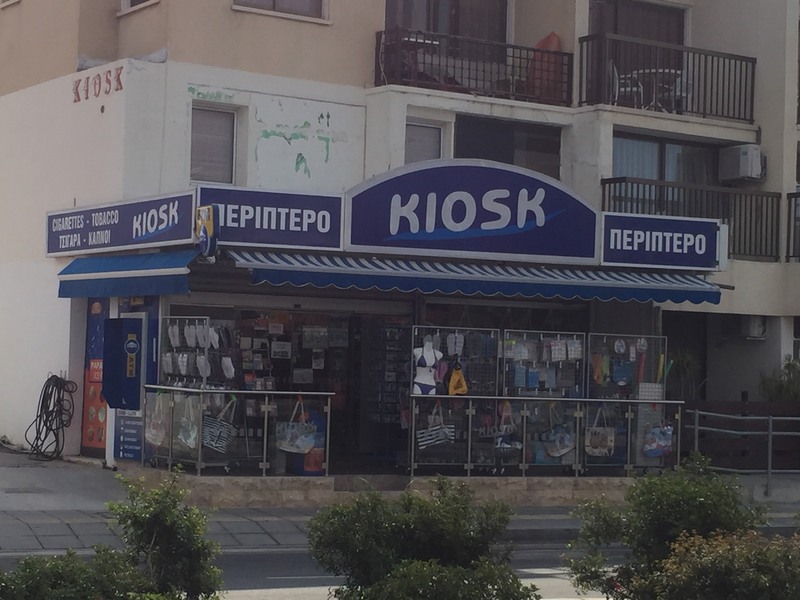 As I mentioned in my previous article, try to avoid the Kiosks (in Greek ПЕРIПТЕРО). All the products are highly overpriced there. Same is the situation with the small, unnamed supermarkets along the main touristic areas. Better keep stuck to the well known local names as Lidl, Sklavenitis, Papantoniou and Alphamega. If you get in a shop and the products are not marked by price tag, it means the merchant will evaluate your solvency and will give you an optional, usually very high price. Go out of such stores, if you notice a massive lack of price tags. Never buy from the “supermarkets” inside the vocational villages. For example, the 6 bottle mineral water pack, which you are supposed to buy for just an euro and a half, will be no less than 4,50 Euro there. Just complete a 10 minute walk and go to the well known one. Being a former British colony, Cyprus gets the heritage of driving on the left side. After 25-year active driving track record it’s quite irritating for me. When I met and get to know a group of Australians in Paphos, I was not clever enough and complained to them about the wrong side of driving and walking in the city. The immediate reaction was:” Nooooooo, it’s the right side of the street”. Australians! In fact, it could be quite dangerous for the pedestrians, while crossing the streets. We, the right side drivers and walkers, are used to look at the left side, before crossing, to check if a car is approaching. If there is nothing on the left, then we cross the street. Well, in Paphos the left side is always empty and the left look doesn’t work. The danger comes from the right side. So, look at each direction, make sure you were not confused and then cross the street. If you come to Paphos with the idea for partying and having fun, then you were terribly mistaken. It’s a very family orientated place. The vast majority of the tourists here are mature couples or young families with babies and toddlers. I was told Paphos is turning to a “British retirement village” lately. An extremely high number of mature visitors on site. It’s lovely to see them holding hands, laughing, dining together, doing sport, enjoying the sea shore. Nothing bad, just be advised. If you are single, looking for fun, new encounters and never ending party, then you should move to the other side of the island, to Agia Napa. 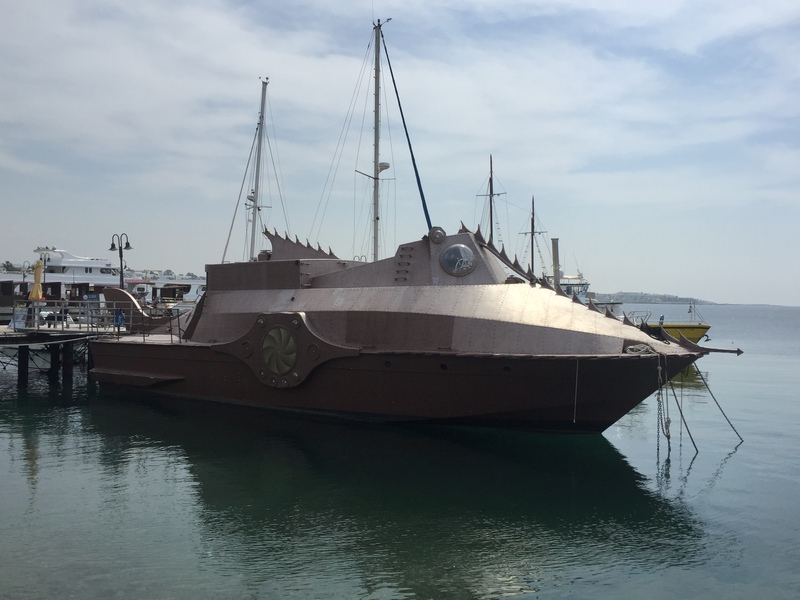 The distance between Paphos and Agia Napa is about 180 km, so if by accident you were mistaken to pop up at the wrong spot, it could be fixed in a few hours. 85% of the men belong to some of the groups above. The other 15% I have not met yet, so the group percentage could be fluctuating. I called it “drama”, because when you are on an island, in the middle of the sea, you expect to have plenty of fresh seafood in the restaurants, probably the most common and affordable food. But not on Cyprus island. The seafood is available, but it’s so expensive, that “affordable” is the last name you’d call it. After a quite long stay for a business purpose, I asked my colleagues on site, why we have never eaten fish up to now. The answer was, it’s too expensive and could be eaten just on occasions. It was a very surprising response. Then I checked the situation in some regular pubs and gin joints. The price per fishmeal starts from 15 euro per person. The meal is nothing special, mostly fried fish or squids, but doesn’t go below 15 euro. Shrimps and octopus dishes go priced higher. Whatever attraction you would like to visit, enjoy or experience in Paphos, it starts from 30 Euro per person. It doesn’t matter if it’s a traditional Cypriot dinner, Waterpark visit, Paphos zoo or any sightseeing nearby. Not everything is worth to visit, though, so I would recommend making a research in advance. By my opinion there are extremely boring tours and sights, but they are still offered at the mentioned above price or higher. Most of the attractions are reachable by public transport, which is very cheap in Paphos, and would save you lots of money. For example, I do not understand the shopping tour to the capital Nicosia for 30 euro per person. Neither I do the church tour. The turtle sanctuary is worth only seasonally – August to October. There are tons of brochures in three languages – Greek/English/Russian. I would recommend collecting as many as you can of them, then compare and prioritize. The Cypriots are experts in advertising and bragging everything in their pocket with the only purpose to soak as much money as they can. To avoid any disappointment and extra money payment, just make sure what do you really want to visit. A good planning and organization would assist you to ignore unworthy attractions and redundant expenses. Two days in Paphos are enough to visit the main sights. If I were you, I would skip it for a long holiday and would rather switch to Limassol, which is just 60 km away. Have a good time!